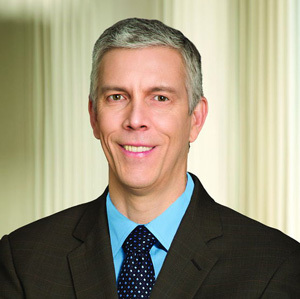 Arne Duncan has added another organization to his résumé. The former secretary for the U.S. Department of Education under President Obama recently joined the board of Turnitin, an education technology company that provides services for writing help, literacy skill development and plagiarism checking in K-12 and higher education. Duncan currently serves as a managing partner for Emerson Collective, a philanthropic organization run by Laurene Powell Jobs that focuses on education, immigration reform, the environment and other social justice initiatives. He's also a nonresident senior fellow for the Brookings Institute with a concentration on education policy. Turnitin noted the addition of Duncan to its board would "give the company additional insight and direction into how technology tools can drive significant change across districts, states and college systems." "I look forward to the opportunity to work with Turnitin on scalable initiatives that support the core educational skills and promote student success in K-12, higher education and beyond," said Duncan in a prepared statement. Duncan serves on numerous other boards, including Pluralsight, a Utah-based company that develops online courses for technology professionals; Revolution Foods, a provider of healthy foods for schools and families; the Lucas Museum of Narrative Art; and Ariel Investments, among others.